Noise pollution is a problem—particularly for those who live in busy, built-up areas. The noise transferring through your windows is especially difficult to deal with, as many of the most popular soundproofing methods do not work for windows. Unlike a wall, you cannot place a piece of furniture across a window to block the noise or add insulation. Any soundproofing choices you make must be focused on keeping the windows useable and cannot block the glass itself. 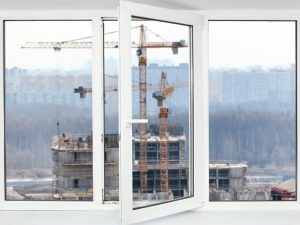 You may be able to find soundproofed windows to help reduce the noise transfer though these are more expensive to purchase than other alternatives. Additionally, if you are renting your space, you may be limited to choices that are easily removed and do not affect the structure of the house. The perfect solution depends on the type of windows you have, as well as your budget, but the ideas below provide you with a starting point. If your windows are damaged in any way, this lets in more sound than you might suspect. Even a small crack adds to the noise transferred from the outside. If a windowpane is cracked, try replacing it before you attempt any further sound-dampening methods. Damaged window fastenings prevent your windows from closing and let in additional noise. Fixing these issues helps prevent noise transfer from your surroundings, including the sound of traffic. If the panes of your windows are loose, you need to re-glaze them. Hire a professional for this or attempt it yourself depending upon your skill level. Although time-consuming, the job itself is relatively simple if you have the correct tools. Scrape away the glaze around the window, remove the pane, and make sure the frame is in good condition. After any necessary repair work, the glass is then replaced, and new glazing must be added around the edges to prevent any further issues from occurring further down the line. Storm windows are an excellent way to reduce noise transfer into your home. Purchase long-lasting models made with metal frames and put them up whenever you require them. Wooden storm window frames are better at insulating than other options, but they warp with changing weather, and they tend to be much heavier than metal-framed windows. Choose a temporary storm window if it suits your needs better. These might be plastic sheets you place over the window and fit into the frame over the glass pane. Purchase soft plastic coverings that are sealed directly onto the glass with the application of a heat gun. Adding extra window panes provides additional soundproofing. For some, this means having new windows installed with double or triple glazing. This is preferable if it is an option for you in terms of budgeting, as there are no additional steps to take once the windows have been installed. You may not have the option to install new windows if you do not have the extra income to accommodate for this expense. Alternatively, you may already have glazed the window multiple times and are still suffering from excess noise transfer. Use a removable window pane or insert to alleviate this issue as these are like interior storm windows but have been specifically designed for indoor use as a sound absorption device. The insert fits into the window frame and seals itself, blocking additional noise carried through the air. Purchase an insert designed for quick removal if you want to open your window at any point. Any holes, cracks or pockets of air around your windows and their fittings result in increased noise transfer. Filling in these holes blocks the air that lets the noise through. Seal the windows themselves by adding weather stripping, reducing air flow when the window is closed. Check around the window frames to see if there are any cracks letting in air. This is particularly important in older buildings. Any holes or cracks must be filled with caulk or another sealant. If you are a renter, contact your landlord regarding these issues. For a sliding window, add vinyl liners along the runners for added noise absorption. The cavities in which the counterweights are held must be insulated as well, as the hollow space lets in additional noise. Special sound-dampening curtains can be purchased at several retailers. These often have a soft core such as wool between the layers of fabric. Sound-dampening fabric blocks can be laid directly against your window, keeping the noise from entering through the glass. Heavy and thick fabrics are the best choice for drapes. Pleated curtains provide additional sound absorption through the extra fabric. The window treatments on their own may not be enough to prevent the noise transfer altogether though they are an excellent addition to other soundproofing techniques you might try. If noise is still making its way through your windows, you may be able to prevent it from disturbing you. There are several types of acoustic panels and sound absorption devices suitable for dampening the noise from your windows. A retractable noise-dampening panel is designed to be placed in front of your window at night when a loss of visibility is no longer a concern. Make sure to purchase a panel that has been designed to be free standing, as these differ from panels intended to hang against a wall and prevent echoes. Some panels and sound absorbers can be attached to or hung from the ceiling. These are helpful if you are concerned about noise during the day and do not want to block the light from your window. You may need to obtain permission from your landlord to install these.